Wheels of Rage is a crazy driving game. Put the pedal to the metal as Gumball’s mom. It is Gumball’s birthday, and his mom is doing anything to make it the perfect birthday. Drive fast as you pick up Elmore, deliver pizzas, and race for cash! Watch The Amazing World of Gumball on Cartoon Network. 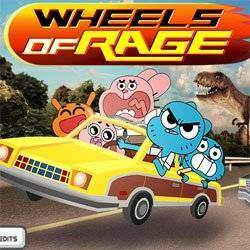 Have fun and enjoy playing Wheels of Rage – The Amazing World of Gumball.